A new promotion could mean there is a possibility of relocating, if you are in need of a Toronto corporate apartment, you have stumbled upon the right site. We recognize exactly what it is that business executives need in furnished condo rentals and are ready to facilitate in making your Toronto accommodations as easy as possible. This roomy one bedroom plus den contemporarily furnished corner unit is approximately 690 square feet and has an additional 100 square feet on the balcony, which overlooks downtown Toronto. It is filled with light since there are walls of floor to ceiling windows, and 9 foot high ceilings. Also, there are beautiful hardwood floors throughout the suite, except in the master bedroom where there is cozy carpeting. Moreover, there is a fully supplied kitchen, ready for prepping and cooking all your favorite meals. 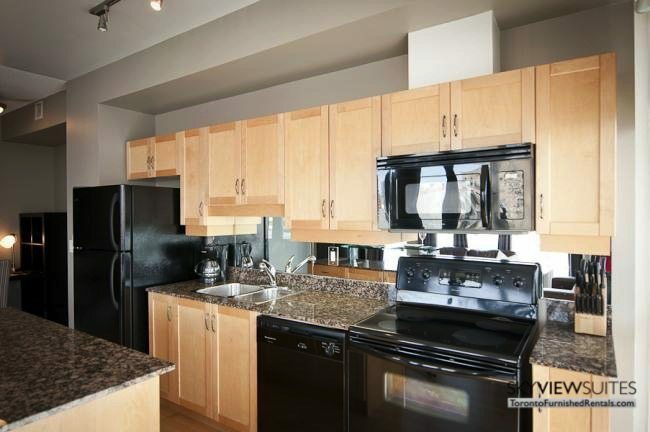 Brand new black appliances are surrounded by granite countertops. Also, there is island seating for two which comes in handy. The bright and open living space is set up with comfortable leather couches and espresso colored furniture which holds the flat screen TV. The master bedroom has a queen sized bed with 300+ thread count linens, masses of storage space and its own full bathroom stocked with luxurious towels. In addition, there is also a two piece guest bathroom, so you don’t have to share the throne. Furthermore, there is an open concept den with a work desk and enough shelving to hold your documents and other important papers. This Toronto serviced apartment also has a washer and dryer inside the unit, so you can keep your clothes nice and fresh. What is more impressive is the bi-weekly cleaning service which comes by to clean your sheets and towels. Our Toronto short term rentals at the Opus are modern condos with exterior glass finishes and chic interior design. Situated on the edge of Dundas Square (Yonge and Dundas), this location puts you within close proximity to artisan markets, outdoor concerts and films and café style seating within the square. You are sure to spot street performers as well as vendors all around this neighborhood. Just across the street is downtown Toronto’s largest mall, the famous Eaton Center. It spans several city blocks and is home to numerous shopping stores. Also, this condo is so close to St. Michael’s Hospital, the Canon Theatre, Massey Hall, the entertainment complex better known as Toronto Life Square and so many more restaurants and venues to enjoy. 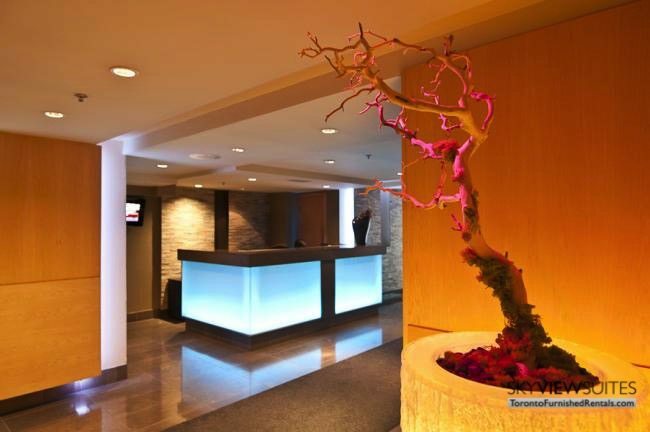 Right next door is The Opus’ parent building, the Pantages, here, you can enjoy the Pantages Spa and gym facilities. Readily accessible at this location is Toronto’s underground PATH system, two subway stops and convenient highway access. 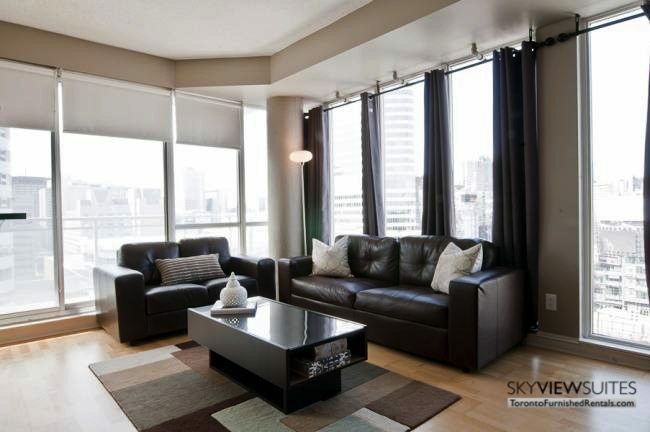 For more information about this Toronto corporate apartment, click here: Furnished Rentals.